I am on holiday so will be a few weeks late with this month’s blog rankings. Caitlin Johnstone is an amazing woman. Very literate and on the ball politically. Her analysis of recent changes in information transfer offered by the internet and the reaction of mainstream media is important. This speech, “How to Win a Grassroots Media Rebellion,” is well worth watching. It explains a lot of the recent history of the media, the control of information and the threats to media and internet access by ordinary people. If you find her arguments interesting follow her on Facebook, Twitter, the Medium, and on Steemit. Today and tomorrow we remember the end of the war in Europe 72 years ago. I think this video provides a fitting illustration of what that war meant to nations and families around the world – and why we commemorate its end. It’s also an excellent example of what can be done with data visualisation. I don’t think I have seen a better presentation of the reality of that war – of the numbers of soldiers and civilians killed in the different countries during that war. Something to aspire to for anyone involved in data presentation. 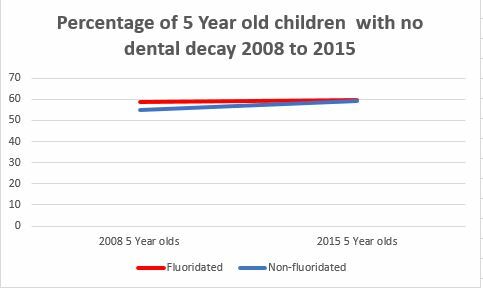 Data are presented for “% caries-free” – the proportion of children with no tooth decay, and mean dmft – the average number of decayed missing or filled tooth for each child. Amnesty International has just produced a report on mass executions in a Syrian prison. It has received a lot of publicity and can be downloaded from Human slaughterhouse: Mass hangings and extermination at Saydnaya prison, Syria. The trouble with reports like this is that they can be based on limited evidence – yet once published they become evidence themselves. From now on people will cite this report as “evidence” for mass atrocities in Syria, despite the fact the report contains only a small amount of evidence, mostly hearsay from opposition sources, and extrapolates freely to produce very large numbers. I agree – where there is smoke these is usually a fire. And I do not believe Syria has been exempt from human rights problems. But, then again, what country – inducing those claiming to be bastions of democracy – are really exempt from human rights abuses? And do the human rights violations in secular Syria occur so frequently or unjustly as in neighbouring Gulf states like the theocratic Saudi Arabia? Anyway, download and read the report if you are interested. I have. But I have also looked for critiques of the report. I think the above interview with the Syrian President provides some response to the Amnesty report. His specific comments on the report occur from about 13 minutes on – but the whole interview is very interesting. Because of his views on the Syrian conflict and its possible solutions. But also in his refusal to interfere in the internal affairs of the US by taking sides in domestic disputes. Perhaps we could all learn something from his attitude. This is the second article in the debate between Tom O’Connor and me. It is a response to his post Debating fluoridation and tyranny – Tom O’Connor responds). I think Tom’s concept of “freedom of choice” is confused. He appears to be arguing for his own right to determine a social decision. But that is undemocratic, it imposes an individual’s wish on society. We all have the freedom to influence, make submissions on, contribute to, etc., a social decision. In the end, that decision is made democratically. The minority does not have the right to use the individual’s “freedom of choice” argument to demand that decision not be democratic. That is not the ‘tyranny of the majority” Tom claims because on most issues the individual still has the “freedom of choice” to make individual arrangments to satisfy their position. No one is being coerced and the individual can take personal responsibility for their own arrangements. This is particular true with community water fluoridation (CWF). Tom and I have different values or politic outlooks underlying our different attitudes towards CWF. I don’t want to put words in Tom’s mouth but in practically he is opposed to CWF despite the clear social benefits. He is claiming his personal “freedom of choice” is more important than the community’s – or at least the majority of the community. In contrast, I support CWF because of its social benefits. However, I accept the obligation of governing bodies to consult the community when there is a controversy and support the decisions of the community (I also support the right of individuals and communities to make the wrong decision – within reason, of course). In the most general terms, these boil down to issues of social responsibility vs individual or personal responsibility. Put simplistically, some would see the conflict a between a “socialist” or “libertarian” perspective. (I apologise for using labels.) These different values systems lead to different understandings of freedom of choice (and of being “forced”). Given the stand of personal responsibility, as a personal values system, Tom should not need to seek the justification of advancing or questioning facts. He should simply stand on principle, and seek support for that principle. On the other hand, there is an obligation on people arguing for social responsibility. We need to show that the advocated social policy provides a net advantage to the community and/or individuals. If there are no advantages there is no point in such policies and the personal responsibility or “libertarian” position may as well stand. Tom is welcome to his values system, and he no doubt says the same about me. We live in a pluralist society and most of us accept such differences are handled by the democratic process. I should also add that most people do not adhere to an absolutist “libertarian” or “socialist” approach and prefer a more balanced and sophisticated approach to social issues. Society usually attempts to balance individual rights/responsibilities and freedom of choice against social responsibility. After all, individual rights and social responsibility are co-dependent. Our individual rights and freedom of choice cannot survive where our freedom, rights, health and well-being are not supported by sensible social policies. A democratic social decision may appear to result in the loss of that freedom of choice. After all, I can express my freedom of choice to have a Green government, but after the election I have to accept that freedom is put on hold for another three years and in the meantime I have to put up with a National-led government. But that does not deprive me of the freedom to advocate for policies underlining my preference for the Greens – and under MMP such advocacy can be effective even between elections. Similarly, the minority in a decision on CWF does not lose personal “freedom of choice.” If they are willing to take personal responsibility for their situation they can with very little effort, make personal arrangements. Those with a hangup about fluoride can use to filters or alternatives sources. Those who wish to use fluoride can resort to mouth rises or alternative water sources. In taking these actions we are exerting our freedom of choice. Tom has stepped outside the ethical issues to argue some statements of fact which need challenging. Putting “both sides” into the same box of “engaging in pseudo-science and scare mongering” is a Clayton’s argument. A claim made without any substantiation but appealing to “balance” nad “fairness. Rather than relying on such “warm fuzzies” Tom should present the examples and evidence if he wishes to make such claims. Similarly, unsupported claims of doubts and the need for caution can be a way of discounting the science and its quality. Hence, the emotional slogan “if in doubt, leave it out!” Society should make decisions based on evidence, not warm fuzzies and catchy slogans. We are familiar with the financially and ideologically motivated purposeful raising of doubt on issues like the science regarding tobacco use and climate change. Merchants of Doubt by Oreskes and Conway provide a good description of such dishonest tactics – and the title is very appropriate. What these standards do is set maximum acceptable values (MAVs) for a whole list of possible “harmful contaminants” – occurring naturally or from the water treatment itself. Think about it – no realistic body would set standards demanding water was “free from all other substances and organisms as possible” – leaving interpretation up to the individual operator! Of course, individuals may want to lower these MAVs (or even make them zero) – but they are derived from the best available science and practical considerations. If individuals are unhappy they can, of course, challenge the standards. But they do not have the “freedom of choice” to arbitrarily replace them with their own personal values. They do have the freedom of choice to use other water sources or tap filters. That is the sensible and responsible thing to do, rather than childishly demand a change just to satisfy their own hangup. This involves additions to water that Tom has absolutely no control over. Why does he not object to that addition on his ethical stance that he has the “freedom of choice” to control what goes into community water supplies? Personally, I would oppose chlorination long before I objected to fluoridation because irrespective of whether there is any detectable chlorine “at the end of the process” (there should be), chlorine can react with naturally occurring organic material to produce possible hazardous or carcinogenic compounds. That is why local authorities check for these in our water. My city uses UV irradiation for the early disinfection process and only adds chlorine at the end so that the tap water remains organism free. But if I lived in a city where the first disinfection use chlorine I would seriously consider using a tap filter to remove possible hazardous compounds. Does he bother to exert that “freedom of choice” when he shops? Has he even checked the availability of uniodised salt? I checked the other day and my supermarket had plenty of iodised salt but no specifically non-iodised salt. It had boutique salts (even “chemical free” salt) and I imagine the chemophobic shoppers might prefer those products to iodised salt – not realising they also contain iodine. I would willingly support mandatory folic acid fortification. More countries will probably do this in future because the evidence is pretty clear that it helps prevent the tragedy of neural tube defects. It seems a sensible approach because of the need for folic acid at the stage of pregnancy where the mother may be unaware. At the moment, New Zealand has a voluntary folic acid fortification system. About 17% of packaged bread was fortified with folic acid in 2012. The industry is working towards fortification levels of 50% – with at least 25% meant to be achieved by the end of 2014. Tom, you appear to oppose folic acid fortification. Do you check your bread packaging to check it hasn’t been fortified? I suggest hardly anyone does so. There are lots of things individuals can have hangups about. Some people object to chlorination. Some to pasteurized milk. Given that society does set standards for our food and water it is inevitable individuals may sometimes have to take personal responsibility and check the food and water they purchase. But I cannot understand the directed concern over fluoride as it is one of the easiest things to check and make personal arrangements for. While I had plenty of choice at my supermarket if I wanted “fluoride-free” water. I had no choice if I wanted “iodine-free” salt” or unpasteurized milk. If I had a hangup about folic acid I would need to make the effort to carefully scrutinise bread packaging to find “folic-free” bread. And do that often because of plans to increase folic acid fortification of bread over time. What about some monetary figures to claim alternatives are not affordable? Frankly I do not think he has a leg to stand on here as people who choose to opt out of our secular education and free hospital systems face far bigger financial costs. In my experience most anti-fluoride campaigners already take such steps for themselves and when pressed claim they are speaking up for others less fortunate than themselves. Yeah, right! Tap filtration practical and convenient. “Fluoride-free” water is readily and cheaply available (more so than unpasteurised milk and non-iodised salt I have found). And the slight inconvenience involved is of little consequence to someone who really believes the anti-fluoride story. Incidentally, several cities provide “fluoride-free” community taps. the fact these get very little use suggests to me that those who are really concerned already have more convenient arrangements.